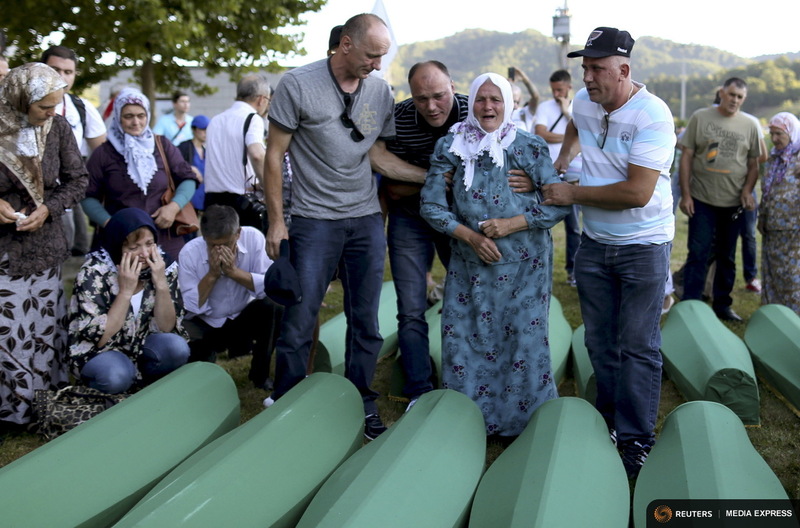 POTOCARI, Bosnia (Reuters) – Tens of thousands of people will gather at a cemetery near Srebrenica in Bosnia on July 11 to mark the 20th anniversary of Europe’s worst atrocity since World War Two, still tortured by voices of denial and a seemingly endless search for the dead. Abandoned by their U.N. protectors toward the end of a 1992-95 war, 8,000 Muslim men and boys were executed by Bosnian Serb forces over five July days, their bodies dumped in pits then dug up months later and scattered in smaller graves in a systematic effort to conceal the crime. More than 1,000 victims have yet to be found. The bones of 136 newly identified victims will be interred beneath marble gravestones in the Potocari memorial cemetery in eastern Bosnia, in what has become annual ritual as the graves are discovered. A U.N. court has ruled the massacre was genocide. Many Serbs dispute the term, the death toll and the official account of what went on – reflecting conflicting narratives of the Yugoslav wars that still feed political divisions and stifle progress toward integration with Western Europe. Bosnian Serb leader Milorad Dodik last month described Srebrenica as “the greatest deception of the 20th century”. Serbia, which backed Bosnian Serb forces with men and money, is sending Prime Minister Aleksandar Vucic, fresh from enlisting ally Russia to veto a U.N. resolution last week that would have condemned the denial of Srebrenica as genocide. A former disciple of the “Greater Serbia” ideology that fuelled much of the bloodshed of Yugoslavia’s demise, Vucic has rebranded himself as pro-Western, embracing Serbia’s ambitions of joining the European Union, which depend partly on the pursuit of regional reconciliation. Russia called on July 10 for all people responsible for the massacre to be brought to justice. “You cannot build reconciliation on the denial of genocide,” said Samantha Power, Washington’s ambassador to the United Nations who was a 24-year-old journalist in Bosnia at the time. “It is important that he (Vucic) goes there and that he sees for himself the results and the destruction caused by the genocide in Srebrenica,” Power was quoted as saying on Thursday by the Bosnian daily Dnevni Avaz. Bill Clinton, who was U.S. president at the time, is among those due to attend. In Washington, President Barack Obama said the United States would mourn the loss of the victims of what he also called a genocide. Ever since the massacre, the West has faced questions over how it allowed the fall of Srebrenica, a designated U.N. “safe haven” for Muslims Bosniaks displaced by the war. Months later, NATO air strikes forced the Serbs to the negotiating table. A U.S.-brokered peace treaty ended the fighting and enshrined in Bosnia a complicated and unwieldy system of ethnic power-sharing that survives today. The accused chief architects of the massacre – Bosnian Serb wartime political leader Radovan Karadzic and military commander Ratko Mladic – remain on trial at a U.N. court in The Hague, protesting their innocence. “One cannot describe with words how I feel today,” said Zijada Hajdarevic as she escorted the remains of her brother on Thursday from the morgue to the cemetery, where her grandfather and other close relatives are all buried. “We knew he was gone, but it will be easier now we know where we can visit his grave,” said Hajdarevic, who is still searching for her father.